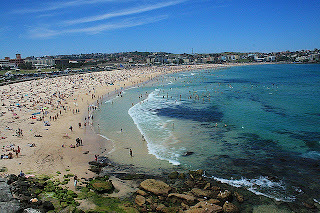 Bondi Beach, which is the name of the beach as well as the surrounding suburb, is one of the best known beaches in the world. Located in the eastern suburbs of Sydney, in Australia, it is about one kilometre long and situated at only seven kilometres from the city centre. The beach is as much a symbol of Australia as the kangaroo. It symbolizes the Australian lifestyle, where leisure time is as important as work and where they manage to combine both. It was added to the Australian National Heritage List in 2008. It has a total population of over 10,000 inhabitants, among which only forty percent are Australians. The beach is a popular destination in the summer, but also in the colder months of winter, when it still attracts lots of surfers, as well as people who want to enjoy a nice walk in the sand. On a typical summer weekend, it is visited by more than 40,000 tourists. Its name comes from the Aboriginal word "Boondi", which means “noise of water breaking over rocks”. For a long time, Bondi Beach was not considered by the authorities as a potential investment. It was seen as nothing more than a huge sand dune, too far away from the Sydney Central Business District. It is only in 1855 that Francis O’Brien, owner of the Bondi Estate, tried to obtain official permissions to make it available as a public picnic ground. However, bathing was not authorised until 1906. Since it is accessible for the public, the beach has been synonymous with surf. 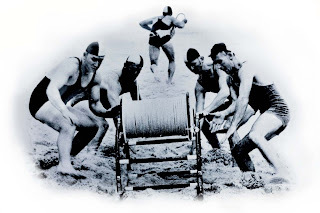 Opened in 1906, the Bondi Surf Bathers' Life Saving Club is the world's oldest surf club. It was created, as its name suggests, to save lives. It quickly developed special techniques that are now used by the whole world. It is globally known since a terrible accident which happened on 6th February 1938. After a series of large waves, the club members saved 300 people in 24 hours. Only 5 people died. The day is known as ‘Black Sunday’. The beach is in fact bordered by two headlands. The southern side is reserved for surfboard riding because of its famous strong rip current, which has been rated 7 on a 10-scale. On the northern side, which is calmer, yellow and red flags define the areas which are safe for swimming. The suburb contains an important commercial area and is full of activities available whenever you wish, during the day but also at night. You can find an indefinite number of restaurants, cafés and snacks. Because of its iconic status and the many tourists it attracts, there are hotels to be found in every price range. 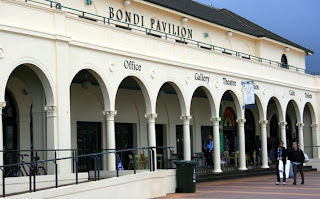 The most important building in the suburb is the Bondi Pavilion, a community cultural centre which contains a theatre, an exhibition gallery, studios, rehearsal and meeting rooms, etc. This explains why it is the centre for major festival performances during the whole year. One of the major events of the year is the City to Surf race, which is held each year in August and attracts more than 60,000 participants. They have to complete a 14 kilometre run from the centre of Sidney to Bondi Beach. In addition to many other activities, such as the Flickerfest, a short film festival, the beach’s market is open every Sunday.